I am a crazy scrapbooker with an amazing husband, family and group of friends! This week we're beginning something new here at MDW, the Designer Extra. We all need a little creative kick in the pants every now and then, and we're here to offer up our very best artistic steel toe boot salute just for you! Every two weeks we'll be offering up a technique, layout idea or small project for you to try. We'll kick things off with two easy card designs featuring Tinkering Ink papers and Chatterbox "Eclectique" clear stamps. I have to admit, I was a little hesitant to purchase the Chatterbox stamp set. It is very different from the style I usually buy, and I wasn't sure how much use I'd get out of them. Boy, I certainly had nothing to fear! They have been my go-to stamps for the last three months! I've made at least two dozen different cards with them, as well as using them on layouts. Birthday, wedding, kids, love- they have worked with a wide variety of themes. With their bright color and bold designs, Tinkering Ink papers are perfect for summertime, birthday and celebratory layouts, but those same qualities make them perfect for cards, too! So, what are you waiting for? Let's get started! For the "Born to Fly" card you'll need Tinkering Ink "Woodland Sprite", blue Bazzill cardstock, scraps of red, green and white cardstock, and a Making Memories button brad. Since these are just the card "faces", you will need to attach them to folded cardstock or a pre-made card. Directions: Cut a 4.25 by 5.5 inch piece from both the Tinkering Ink and Bazzill papers. Cut away part of the Tinkering Ink paper, following the design. Attach patterned paper to cardstock background. 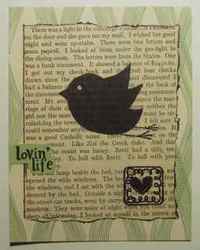 On a scrap piece of cardstock, stamp Chatterbox bird with Archival Ink. Cut out bird and punch eye; attach bird to card and draw feet with a pen. 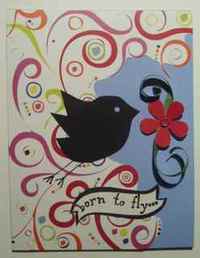 Stamp Chatterbox "Born to Fly" on scrap; cut out and attach to card. Punch a flower from red cardstock, and pierce brad through center. Cut a thin strip of green cardstock and wrap ends around a pencil to curl paper. Attach both pieces to card with glue dots. Attach card face to folded card. The "Lovin' Life" card is super easy! Cut a 4.25 by 5.5 inch piece of Tinkering Ink "D'Vine." Tear a page from an old book and ink the torn edges with black soot Distress Ink; attach to card. Stamp Chatterbox bird and heart on page with Archival Ink. Stamp "lovin' life" on reverse side of "D'Vine." Cut out and attach to card. Glue face to a pre-folded card and you're done! Now, that wasn't too hard, was it? Check out all of the Tinkering Ink papers at My Daughter's Wish. They make great birthday, congratulation and kid's cards! Thanks Casey - great cards. Enjoyed your make and take on Saturday. I look forward to taking one of your classes sometime soon.